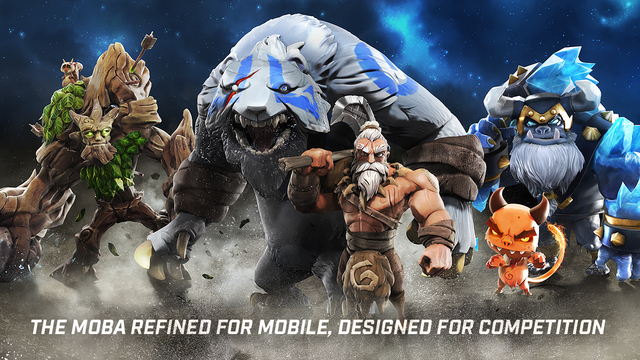 From three-times winner of ‘Best App Ever Award’ comes a fresh take on the MOBA genre. What Spacetime Studios have done with their new title Call of Champions [Free] is truly remarkable. Call of Champions is not your typical MOBA, but a refined and enhanced game with unique elements that set it on top of the MOBA food chain. Its fast-paced battles make it ideal for all action loving players, especially the ones that have limited time on their hands. Matches average around 5 minutes, thus replacing the luxury of strategic planning with the cunningness of tactical manoeuvres. With over 15 champions that are fully customizable hailing from 8 fascinating realms, you will compete against millions of competitive players from around the world. The game features great connectivity with a blazing fast match-finding system; perks that most MOBA games lack on mobile. In addition, a unique spectator mode has been incorporated into the game where you can follow players, pause, and instantly replay. From our rich experience in MOBA games, we found that the most problematic aspect by far is when a team mate quits the match and leaves you in a disadvantage. Many who do leave act in the name of ”trolling” to anger their team mates. After spending over 30 minutes on a MOBA game and then finding yourself abandoned, it becomes a nightmare in the making. However, Call of Champions solves this massive issue by replacing the team mate who left with an enhanced AI to help out. This game, ladies and gentlemen, is trolling free! Not to forget, the globally successful Spacetime Studios, the company behind this game, is the creator of Arcane Legends, Pocket Legends, and Battle Command. Having authored such huge titles, it is only natural that Call of Champions will be one of the best MOBA games on mobile devices. You will enjoy smooth 60 frames per second with only 80 megs of space. The game is simply unrivalled with all these unique features that it embodies. It is now released worldwide and you can get it from the App Store. Stay tuned with our website so that we keep you updated about everything Call of Champions related. You can check the trailer for this game below. wow looks like Nintendo 64 style games! !